In occasion of the 50th anniversary of the flood that occurred in Florence, during the night between November the 3rd and the 4th in 1966, a lot of initiative took place in the town. At the Uffizi Gallery a photo exhibition was inaugurated on November 4th and will remain open until January 8th 2017. 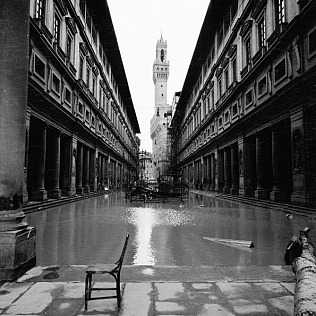 The photographic exhibition presents a series of pictures taken by the Photography Department of the Uffizi. The images represent the first interventions - on the morning of November 4th - that were put in place to save the works of Gallery, especially those that were on the ground floor. At that time, even the Photography Department was on the ground floor, in the premises of the \"Vecchia Posta\": much material and many equipment were lost. The photographs are all black and white and are exhibited in the room 41.